Lethbridge, Alta. 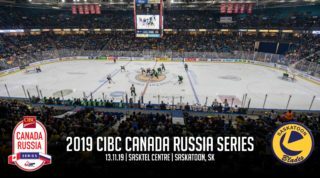 — The Saskatoon Blades are heading home for Thanksgiving on a happy bus after a 3-2 shootout victory Saturday night in Lethbridge over the Hurricanes. The win was the third straight for the Blades improving their overall record on the season to 6-2-0-0. 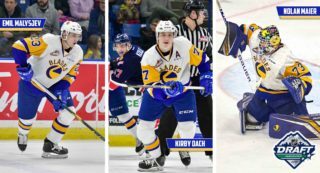 It was also a statement finish to a gruelling 4 games in 5 nights road trip in which the Blades went 3-1-0-0. The Hurricanes came out firing on all cylinders putting the Blades back on their heels in the early going. Jake Kustra was called for a checking-to-the-head minor 1:22 into the game as a result of hustling back to break up a quality scoring chance for the Hurricanes. Lethbridge capitalized on their man advantage as Kelti Jeri-Leon ripped a shot over the shoulder of a screened Nolan Maier right before the Kustra penalty expired. 🚨 Paterson' 2nd of the season ties it up with 5:30 left in the 1st! A series of Lethbridge penalties followed and the Blades used their second opportunity to even the score. Kirby Dach fed a laser like pass through the crease for Josh Paterson to tap in; his 2nd goal of the season. Dawson Davidson extended his personal point streak to 5 games picking up the secondary assist on the play. The veteran defender for Saskatoon went into Saturday’s game as the league leader in points by defensemen, and he wasn’t done there either. The Blades took a 12-7 lead on the shot clock into the first break, tied at 1-1. Saskatoon found another gear in the second period and looked primed to take the lead. However, the Hurricanes struck again as 17-year-old forward Logan Barlage deflected a point shot from Danila Pavilko past Nolan Maier who was already moving across in the other direction to make the save. The goal gave the home side some life, but the Blades kept chipping away and eventually were rewarded. With the seconds ticking down in the middle frame, Dawson Davidson kept the puck alive in the offensive zone down low for Michael Farren, who then fed the puck in front of the Lethbridge goal. Riley McKay was lurking in behind Calen Addison and on the edge of the crease and whacked in his 3rd goal of the season with just three seconds left in period. McKay’s tally tied the game at 2-2 as the 19-year-old winger found the scoresheet for the fourth consecutive game on the road trip. Davidson’s 2nd assist of the night was also his 9th point in his last 5 games. The timely goal from McKay would prove to be crucial as neither found the back of the net in the final 20 minutes. 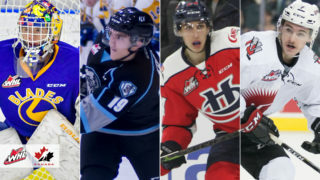 As always the 3-on-3 overtime period was frantic in all zones of the ice but both Nolan Maier for Saskatoon and Reece Klassen for Lethbridge held their ground to force a shootout. Kirby Dach scored the only goal of the combined six shooters, leading the Blades to their 6th win of the season. Nolan Maier was a wall going 3/3 in the shootout after making 24 saves in 65 minutes of play. The Blades power play snapped out of their slump with a goal on four chances. The penalty kill was just 1/2 on the night, but looked dominant in the second outing creating more scoring chances than giving up. 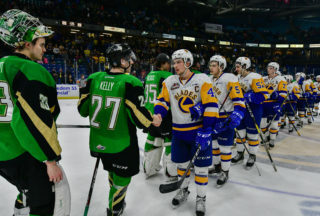 Saskatoon will now take the week to prepare for a five game home stand beginning on Friday at SaskTel Centre against the Red Deer Rebels. 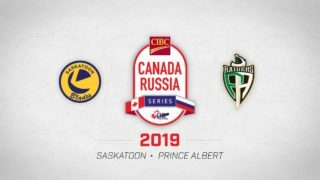 Then Prince Albert Raiders visit Saskatoon on Sunday; their first trip of the season to SaskTel Centre. Game time on Sunday is 2:00pm.